Scientists mapping Venus’s surface with the European Space Agency’s Venus Express orbiter recently received a shock when features on the planet’s surface appeared to have moved up to 12.4 miles from where they were expected to be, reports National Geographic. The measurements, if correct, would seem to indicate that Venus’ rotation has slowed by 6.5 minutes — a dramatic decrease on a planetary level — compared to when it was last measured just 16 years ago. That last measurement was taken during NASA’s Magellan mission in the 1990s, when a single rotation of Venus was calculated to take 243.015 Earth days. Magellan used the passing speed of surface features on the planet to make its calculation, and scientists have long held that measurement as the standard. This leaves a rather large question: What could possibly be causing a planet’s spin to decelerate so rapidly? Since Venus is also Earth’s closest neighbor, should we be worried? Interestingly, the Earth’s rotation is also slowing down, but scientists attribute this to tidal acceleration, frictional “drag” caused by the Moon’s gravitational pull. This explanation cannot apply to Venus’ slowing spin, however, because Venus has no moon of its own. Some scientists have speculated that Venus’ thick atmosphere and high-speed winds could be to blame. The planet’s murky carbon dioxide-rich atmosphere gives it a surface pressure 90 times that of Earth’s. This fact, combined with the hurricane-like speeds of the winds around the planet, could possibly generate enough friction to slow down Venus’ rotation. Other scientists are skeptical. While a planet’s atmosphere has been proven to effect its rotation before, these effects are minimal compared to the degree of slowing that has been witnessed for Venus. Venus’ slowing spin isn’t the only peculiar thing about its rotation. Venus is unique in our solar system for being the only planet that spins clockwise; all the other planets spin counter-clockwise. This effect, called “retrograde” rotation, is another mystery about Venus that has yet to be adequately solved. Venus’ rotation is also by far the slowest in the solar system, which makes the rapid deceleration of its spin especially curious. So far, though, no theory exists that links these other peculiar facts to the planet’s decelerating spin. Agree on that TB. What is it about mainstream physicists that makes them so reluctant to accept what is observed? They refuse to believe their eyes when observations don’t match their abstract theories. A severely overrated lot IMHO. I can hardly wait to find out why it’s my fault. the relative orbital periods of Venus and the Earth may have also changed by a similar magnitude. Thanks Ian. Does this mean that *relative to the Earth*, Venus spins twice per synodic conjunction? We know it spins 12 times in 8 years *relative to the fixed stars*, so does 12-2 = 10 times per 5 synodic conjunctions *relative to the Earth* seems reasonable? I’ve been trying to work this out, but it makes my head spin! I’m saying 12-2 because the synod locations go twice round the circle while tracing out the pentagram of the Earth-Venus synodic cycle. Nice find, did they just find out that all the planets perturb each-other and that their orbits slightly change with each orbit of the sun, because this is already a well known fact. It must be hard to find something when it is starring you in the face or even if you don’t look. Sparks; the perturbations that Astronomers deal in don’t affect spin rates, only orbits. They are in for a shock when Oldbrew and I reveal what we’ve discovered. I know that carbon dioxide can dice carrots, but is there no limit to what it does? The rotational change: E=1/2(mV2), right? The loss of rotational energy must be accounted for a la Trenberth. If the loss has been continuous over 16 years, there is a minimum/yr energy that has gone either into atmospheric speed (unlikely, probably far too great), atmospheric and planetary surface heating and state changes of surficial material. The long-wave radiation of Venus will have to have increased if the planet is hotter. An increase in atmospheric temperature would show up as an expansion of the atmosphere, so there are two lines for temperature rises. Any expansion of the atmosphere might, depending on orbital height, show up as orbital decay of the satellite. Then there is the measurement itself. As in “the clock”. Which seems more reasonable, a planet slowing down or some clocks that are “off”? Every time Venus passes directly between the Earth and the Sun – it always presents the same face towards the Earth. This means that Venus’s rotation is locked with with the relative orbital periods of Venus and the Earth. If the rotation rate of Venus has slowed by 6.5 minutes in 16 years, then it may indicate that the relative orbital periods of Venus and the Earth may have also changed by a similar magnitude. there still appears to be some dispute about the precise orbital period of the Earth, as different methods come up with results that vary by as much as 8 minutes. The orbital period of Venus is 225 days, so Venus orbits the Sun 25.973 times in the space of 16 years. Therefore in 16 years Venus will have made 25 closest approaches to Earth. There is a small but significant exchange of angular momentum at each of these closest approaches, and it is in the direction of slowing the rotation rate of Venus, which is already retrograde with respect to its orbital period. If Venus’s rotation continues to slow down by 6.5 minutes every 16 years it will have stopped rotating altogether 861,000 years from now, which is a negligible amount of time relative to the 4.6 billion-year age of the solar system. I’m with Doug Proctor. Check the clock. Don’t forget Earth is moving too Gerry. So Earth and Venus only meet 10 times in 16 years. If spin is related to orbital period, and orbital period is related to distance, then is the orbit of Venus changing ? and if it is, in which direction ? Doug Proctor: Any expansion of the atmosphere might, depending on orbital height, show up as orbital decay of the satellite. We know that happened to LEO satellites in the 90’s. I was thinking that with the coefficient of expansion of co2 and an estimate of the weight of a 75km thick atmosphere with a 90 bar surface pressure, we might be able to estimate how much a given expansion of the atmosphere would slow Venus down. Thanks Rog, I know what you mean, Astronomers measure the synodic period as a separate factor as having no relationship with the sidereal period, its odd, I look forward to what Oldbrew and yourself have came up with. I’ve looked at the relationship between Uranus’s synodic period and the sunspot record and the position of the planets poles appear to match a rise and fall of activity, I’ve tried all year to find out if the synodic period of Uranus had changed since around 1993. The Blue line is the north pole facing the sun and the red line is the south pole facing the sun. If you look at how Uranus is behaving over the period of the sunspot record it seems to acting like a giant compass, When its north pole is facing the sun and moving away solar activity gets stronger and when the south pole is facing the sun and moving away solar activity gets weaker. and as a matter of fact; Uranus’s south pole was facing the sun in 1993 and has been moving away ever since, at the same time solar cycles have been weakening. Anyway… Just some food for thought! More baffled scientists: this time it’s Saturn’s apparently ‘variable’ spin rate. Sparks: Nice work. Does the blue stripe at 1941 mark where the north pole is pointed directly at the Sun or the start of the N. hemisphere epoch when the equator crosses the line of travel? So if Venus is really a recent addition to the solar system, only several million years or less, and rotating the “wrong way” could it not just be slowing then reversing rotation direction as it looses its original angular momentum? UB 57:6.2 The planets nearest the sun were the first to have their revolutions slowed down by tidal friction. Such gravitational influences also contribute to the stabilization of planetary orbits while acting as a brake on the rate of planetary-axial revolution, causing a planet to revolve ever slower until axial revolution ceases, leaving one hemisphere of the planet always turned toward the sun or larger body…..
Perhaps excess CO2 is slowing Venus up. Co2 is well-known to cause heating and cooling, flooding and drought, so why not slowing? Richard Holle: So if Venus is really a recent addition to the solar system, only several million years or less, and rotating the “wrong way” could it not just be slowing then reversing rotation direction as it looses its original angular momentum? Gerry knew him personally fro their work at the US Naval Observatory and he rates him as having the finest mind. Venus’ rotation rate of 3 turns to two Earth orbits and Mercury’s 3 turns to two Sun orbits is a dead giveaway in my opinion. Stuart and I have discovered a surprising connection between Solar and Earth spin/orbit rates which connects it all together. We’ll be writing about that soon. ntesdorf, I agree the trivial solution is temperature, Venus has slightly warmed. I seem to recall Mars and the Moon likewise but it brought the usual squealers out. Usual thing, ballerina effect, in this case from ever so slight mass movement outwards. TB just notice your calculation. It occurred to me that you are making an assumption about the atmosphere. Clouds are made of droplets of liquids and solid particles. I have read that no one at present knows the composition of the clouds (many doubtful theories such as H2SO4- I prefer liquid/solid CO2) but the weight of the clouds would be different to the weight of the surrounding atmosphere. Tim C: Usual thing, ballerina effect, in this case from ever so slight mass movement outwards. CF: If the clouds are any heavier than the surrounding atmosphere, why are they floating around up there? Thanks Rog, basically yes, the blue stripe is indicating when the north pole is pointed directly at the sun and when the south pole is pointed directly at the sun I’ve marked a red stripe. I originally set out to measure the distance of each of the planets poles from the sun separately and plot the difference between the distance as the planet orbits over the period of the sunspot record. To do this I would need very precise measurements in 100s of kilometers, at the moment I only have values in Astronomical units. In theory tho, the equator at (0°W, 0°N) will be halfway between the red and blue stripes which would be pointed directly at the sun. the polar diameter is 49,946 km so the equator will be 12.4865 km between the poles at (0°W, 0°N), so if it takes approximately 44 years for each pole (alternating) to point directly at the sun, then the distance and time traveled from each pole to the equator (so the equator points directly at the sun), will take 22 years to travel 12.4865 km from each pole to the equator. Well, that’s one way of getting the values for a rough graph, let me know if there is an easier way you can think of. Rog, I filled out the graph by adding the values mentioned above. It’s very rough, but the idea is there. Uranus: North Pole = Blue, South Pole = Red, Equator = green. Sparks: Thanks. What are the purple lines between the alternating green-blue-green-red? The purple lines are the approximate orbital distance facing the sun between either of the poles and the equator. Sorry, its approximately a point on Uranus at 44 degrees North or at 44 degrees south of the equator that is facing the sun. Sparks said: … I would need very precise measurements in 100s of kilometers, at the moment I only have values in Astronomical units. You can try with Celestia: set the date+time; go visit the sun; select the planet (it is directly on the line to the sun now); go to the planet and confirm it has the axial tilt (etc) that you expect; right-click the planet and select reference marks – it will mark yellow, on the planet’s surface, the spot (sub-solar coordinate) on the line to the sun. I’m curious, what’s the astronomical date+time for which you want to make these observations ? Sorry again, that should be approximately 40 degrees. I.e When the North pole of Uranus travels past the direction of the sun, the purple Stripe is 40° North of the equator facing directly at the sun. OR when the South pole of Uranus travels past the direction of the sun, the purple Stripe is 40° South of the equator facing directly at the sun. About halfway between either N-S pole and the equator. Thanks again Sparks. It is noticeable that all the bars of all colours fall near the end of the solar cycles or during minimum. I wonder if that relationship holds further back into the past using the sunspot data rather than the area data. Would it be a lot of trouble to check? No trouble at all, I’ll post it up when I’m finished! I haven’t finished my calcs yet because I’ve been sidetracked by a different Venus related issue. I think I’ve worked out why Venus spins retrograde. Venus is spinning retrograde because it is being tidally affected by two planets – Earth and Jupiter. It has to try to be in a 3:2 to Earth and a 3:2 to Jupiter as well. 12 spins to 8 earth orbits of 1 years, and 18 spins to 1 Jupiter orbit of around 12 years. But it wants to be facing the same way towards Earth at each synodic conjunction, and the only way it can get close to that is by spinning ‘backwards’so it completes 1 7/8 spins as Earth moves 1.6 times round its orbit. Venus is in synodic conjunction with Jupiter every 0.64885 years and this is just right for the Venus spin period of 0.665 years, enabling Venus to nearly face the same way to Jupiter at conjunction too, because it spins ‘backwards’. If I’m right, then it may explain the 6 minute slowdown too, as the cycle of venus’ conjunctions with Jupiter and where Jupiter is in relation to perihelion at the time will affect the timings slightly, and alter the forces brought to bear on Venus. We need to work out the timescale of that cycle so we can make a prediction to test the hypothesis. It would be interesting to know if there were incremental changes, and when. It should not be assumed that just because they took measurements a full 16 year apart, that the changes happened gradually over that period. If there are other teams who have better LOD measurements for Venus, you could look for quantified jumps, right around 2004 and 2012. Really look forward to the Shocking Results by Rog et al.. The Earth comes back into alignment with Venus after 1.5986597 sidereal years = 583.920627 days. Supposedly, Venus always presents the same face towards the Earth at these inferior conjunctions. It’s important to note that the level of precision of this alignment never seems to be clarified. in a retro-grade direction in its orbit, from its starting point. My suspicion is that the rotation rate of Venus is locked with the revolution rate of the Earth in its orbit about the Sun – but only in the long term. Hence, there is some slop (i.e. wiggle-room) around the mean. Meanwhile Jupiter has orbited in a prograde direction by 19.692 degrees which means the same face of Venus will ‘overshoot’ by 19.692 – 8.927 = 10.765 degrees. Close, but no cigar. Thinking about it some more, it’s still the case that Venus can more closely fulfil a 3:2 resonance with both earth and Jupiter by spinning retrograde than prograde, so the hypothesis may yet have legs. Is Venus slowing down so it can get closer to a 3:2 resonance with Jupiter? Or is there some “some slop (i.e. wiggle-room) around the mean” as Ian put it because the Venus rotation period oscillates between locking with Earth and moving towards a lock with Jupiter over a cyclic period, perhaps linked to the precession of the Earth-Venus synodic pentad in relation to Jupiter perihelion. If so, we might expect to see a slowing and speeding up of Venus rotation period on a cycle length of around 239 years. Nice analysis TB!! I see your passion for solar system dynamics is bringing rewards..
Hope you find time to publish…. .
All the other meetings subtract up to a week or so from ~60. But the ecliptic position (as seen from Earth in the above) is equivalent to the actual climate season on Earth. Just my 2¢ for the baffled egg heads. Note the ~60 days are just ballpark figures here; the data points are available as usual. Chaeremon: Thanks. If you are looking at lineups of VEJ without the Sun, what do you think that tells us about forces between the planets? I’m just trying to understand why you decided to plot those configurations. @tallbloke: say, Jupiter is slowest and must be sort of “first” who’s already “there” (I’m simplifying by omitting cases) and practically goes in standby. Then comes Earth, faster around than Jupiter, but also already “there” before Venus. Forces have now had time to build up potential, to and with whomsoever. Then comes Venus, it may “see” the other two longer or shorter (the latter if the line of meeting is also closest to the Sun, etc, still simplifying), and Venus’s appearance behaves like a “switch” on/off. It may be clearer than my words when looking from above onto the orbital plane and advancing +/- 1 or 2 weeks, e.g. at 2012-12-23 or 2013-11-28. All three planet’s angles are obviously small towards the Sun due to Venus’ orbit when they all come closer to the meeting. But I’m looking at the “2D” area made by a longish triangle duration instead of just a “1D” line during (and in comparison to) a very short heliocentric SolVEJ conjunction. I’m still working on the ecliptic sector that is scanned by these +/- max ~60 days, may have found a way to map to that of mother Earth (instead to just that of the meeting). Thereafter a comparison between isolated millenia can make sense; perhaps it’s just the Earth’s advance of perihelion which drives the game and this would be nothing much new. But my gut says: watch out for equinoxes and solstices, they force climate. I found an abstract for a paper that proposes a hypothesis for which “An appreciable probability of stable [spin-orbit] resonance is found to be achievable..” Maintenance of a stable resonant condition would likely entail small variations in the very slow rotation rate of Venus. Nice find Gerry! I think the absorption of solar heat in the upper atmosphere is highly likely myself, given that winds at the surface of around 10kmh while higher up they howl round the planet (in a prograde direction! in 4 days). I read elsewhere that material at the surface is denser on one side of the planet than the other. That would be consistent with the van Flandern Mercury fission hypothesis, and would provide the asymmetry required for a tidal locking with Earth/Jupiter. Clearly, Earth’s tidal effect would be stronger than Jupiter’s. hence the close match with Earth orientation and looser but still near resonance with Jupiter. Context: The superrotation phenomenon in the atmosphere on Venus has been known since the late 60’s. But until now no mechanism proposed has satisfactorily explained this phenomenon. Objective: The aim of this research is to propose a mechanism, until now never considered, which could drive the atmosphere of Venus in its superrotation. This mechanism involves the transfer of the transterminator ionospheric flow momentum to the lower atmosphere via pressure waves generated in the cryosphere of Venus. The mechanism proposed presents a source of energy sufficiently strong to allow the transfer of energy despite dissipation. Method: The energy flow which transports the transterminator flow and the energy lost by the viscosity in the superrotating atmosphere were calculated. Both results were compared to establish if there is sufficient energy in the transterminator flow to drive the superrotation. Finally, the amplitude that the waves should have to be able to obtain the momentum necessary to induce superrotation was calculated. Also an experimental model was made presenting some similarities with the process described. Results: The calculated power for the transterminator flow is 8.48x10e10 W. The calculated viscous dissipation of the superrotating flow is 1.4x10e9 W. Therefore, there is sufficient energy in the transterminator flow to maintain superrotation. The amplitude of the waves generated in the cryosphere, necessary to deposit the power dissipated by the viscous forces, is 10e-4 m for waves of 1 Hz and 10e-8 m for waves of 10e4 Hz. These amplitudes imply that at the altitude of the clouds on the night side there must be a constant sound of 83 dB. If the superrotation of Venus were to stop, with the continuous injection of 1.4x10e9 W, the actual superrotation would appear again in 1.4x10e6 years. @tallbloke: Good find. Let’s wish space probe Akatsuki much success, it already “missed” Venus due to terrible operation problems, but seems still to be on tenterhooks for another try. Wiki says that Akatsuki carries instruments for measuring Venus weather phenomena. But how can it measure the above speculated sound “thunder” on the nightside other than indirectly and unplanned for, with its ultraviolet to mid-infrared cameras. Rog, I started from scratch and worked out the the dates when Uranus’s poles are facing directly at the sun from 1600-2012, I’ve also updated the graphs with degrees of rotation facing the sun. Uranus-solar-1: Shows the North Pole (90°N) and South Pole (90°S) both of which fall near or during solar minimum. Uranus-solar-2:Shows the North Pole (90°N) and South Pole (90°S) and Equator (0°) all of which fall near or during solar minimum. Uranus-solar-3:Shows the North Pole (90°N), South Pole (90°S), Equator (0°) and a Purple stripe for 45°S/45°N which falls near or during solar minimum. Uranus-solar-4:is the same as above with an orange stripe which marks the date when a point on Uranus is directly facing the sun at 67.5°N/67.5°S and 22.5°N/22.5°S which falls around or before solar maximum. *In this graph I have plotted all the dates where the poles, equator and other positions fall during or near solar minimum with a negative value, and all the dates and positions that fall during solar maximum with a positive value. I think I just made some more progress with my Venus rotation puzzle. To recap: Venus keeps the same face towards Earth each time they meet in a synodic conjunction, because it’s rotation in a 3:2 resonance with Earth’s orbit. I think the reason Venus spins backwards, is because it’s also trying to fulfil a tidal resonance with Jupiter, who’s gravitational force on Venus is around the same magnitude as Earth’s. But Venus turns 10.765 degrees too far each time it meets Jupiter. However, it’s within 5 degrees at alternate 33 and 34 J-V synodic conjunctions, which is not far from the Jupiter-Saturn conjunction period. After 67 J-V synods, it’s within a degree, and this is exactly 2 J-V synods short of 44.77 years, the period at which many cycles in the inner solar system converge. The precision of the result makes me pretty sure I’m right about this resonance being the reason why Venus rotates backwards; it wouldn’t be able to fulfil it’s tidal resonance obligations to Earth, Jupiter and Jupiter-Saturn any other way. The standard lamebrain mainstream explanation is that something big crashed into Venus long ago. I think along with all the other relationships we’ve been finding that it’s more likely to be an evolved orbital parameter gradually brought about by perturbations and tidal forces from it’s neighbours than a one-off chance event in a chaotic solar system. Perhaps if those perturbations and tidal forces from more than one neighbour can cause a planet to reverse it’s rotation, they can also cause a planet to speed up it’s rotation? This might explain how Venus got to rotate fast enough to fission a moon, which later became the Planet Mercury, according to Tom van Flanderns theory. Mercury is in a 3:2 resonance with the Sun, and according to van Flandern, this couldn’t have come about if Mercury evolved in situ where it is now. It would instead be in a 1:1 tidal lock like most moons in the solar system. So, Mercury spins three times per two orbits of the Sun, and Venus spins three times per two orbits of the Earth. This indicates they both have in-homogeneous density distributions, as would be expected if one was fissioned from the other, rather than being created from accretion as individual planets. The resulting tidal squeezing may well explain why Venus is so hot at the surface, despite none of the solar radiation getting to ground level through it’s thick atmosphere too…. 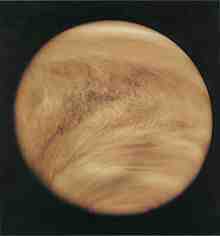 Another clue as to the strong perturbation forces Venus undergoes is indicated by its almost perfectly circular orbit. Thank Wayne for that insight. Venus rotation will re-align to the Jupiter-Saturn synodic conjunction every 210.07981 years. Hello De Vries cycle! Q: What keeps Venus’ orbit so circular? A: Just about every major planet in the solar system by the look of it. No wonder she’s so hot; all the gods want to hug and squeeze her. This is an intriguing subject TB. If we consider the formation of a new ‘stellar’ system, where the formation and ignition of the star results in a sun and planet system not unlike Sol’s, I’d expect all the planets to rotate in the same direction unless there was some ‘extra system’ collision event or other, unforeseen, perturbation (however, an event that would cause a planet to orbit in the opposite direction to other planets is more likely to completely ‘obliterate’ the planet and leave debris floating at that orbital trajectory). Why? Because the coalescing vortex that formed the star has one direction of rotation, resulting in the eventual planetary orbital trajectories of all the system’s planets in the same direction of rotation around the new star. Following the system’s formation the new star is ejecting mass as a stellar/solar wind. This ‘wind’ affects all the orbiting planets and generates a ‘torque’ moment perpendicular to the orbital plane’s axis (thus, ‘in the orbital plane’ [I restate this for clarity]). The ‘torque’ is generated from uneven weighting between ‘wind pressure’ at the ‘leading edge’ and ‘trailing edge’ of the planet’s ‘flight’ through the stellar/solar wind as it orbits the star. IOW, in ‘unperturbed’ systems that orbit clockwise, the planets rotate counter-clockwise and vice versa. Returning to the OP. The rotation of Venus is in opposition to all near planets, so what caused this ‘opposition’? Perhaps a ‘collisional’ and ‘fractionating’ event that initiated a ‘contra rotation’ of the planet? Your OP suggests this TB. If only because Venus is trying to conform to its natural place in Sol’s system. The Earth:Venus ratio of length of day according to NASA is 116.75 = 233.5/2 (233=Fibonacci). Could it just be upside down? Well exactly. So what is more likely to keep the planet intact? I contend a gradual slowdown and reversal caused by tidal action (gravitational and/or electromagnetic) is the more feasible possibility. Upside down is an interesting idea and seems plausible considering the attitude of some of the outer planets. But what could cause that, magnetic poles that switched and stayed that way ? Consider the hypothetical passage of another Venus sized body. If it were to pass roughly in the plane of Venus’s (rapidly spinning and therefore oblate) equator, there would be negligible differences in the forces on the north and south hemispheres. Likewise if it passed over the pole. But if it passed, say, around 45 degrees latitude, there would be a substantial net force attracting the equatorial bulge. As a gyroscope, Venus would tilt at right angles to the attracting force. Hypothetically, this might be sufficient to turn Venus upside down (and possibly slow it down?). Note: the hypothesis is that the passage of another body could do this, the null hypothesis is that there is no conceivable set of conditions in which the purported effect could result. I leave it to the mathematically inclined and knowledgeable to consider this. SFAIK, no two planets have the same inclination of their polar axes to their orbits, with Uranus somewhere about 110 degrees. Which two have the closest inclination? Jupiter and Saturn? Could it be to do with its own internal weight distribution, i .e. is it lop-sided? I saw a claim that Venus presents the same face to Earth because that’s the densest part of the planet so Earth attracts that the most. Looks like Earth 23.45 and Mars 23.98, but if dwarf planets are included Ceres is 3 to its massive neighbour Jupiter’s 3.08. IMHO all we can do is look at the different scenarios that may have led up to this current, ‘odd’, configuration. I think the favourable candidates for causality are either; an asteroid strike, or a near planet strike, in the distant past. An asteroid strike would require the trajectory of the asteroid to both tip the proto-Venus into a gyroscopically stable ‘pole-flip’, then become invisible to following observation. A near planet strike would require a planet in near orbit to collide with the proto-Venus (with the same end result as the asteroid) and resume its orbit at a slower velocity. When considering these scenarios, please pay attention to ‘angular momentum’. My favourite is that a proto-Mercury and proto-Venus ‘came together’ (grazed each other) at slightly different orbital plane angles which ‘flipped’ the proto-Venus (into a gyroscopically stable ‘pole-flip’), ‘slowed’ the proto-Mercury into a lower orbit and ‘accelerated’ the proto-Venus into a higher orbit where they both could survive without further interaction. Perhaps a greater investigation of Mercury may help to confirm this, if any evidence survives. This is all the ‘speculative consideration’ from an engineer’s ‘id’ OB. However, I hope it helps. Sorry to join so late . Forgive me if I suggest to remember that the Earth is part of the double planet system with the moon. How does this duo affect Venus? And why hasn’t Earth slowed like Venus? It all depends on the angle of strike, or near miss. AFAIK, the generally accepted opinion appears to be that a ‘proto-earth’ was hit by a ‘proto-something’ not far off dead centre. As a result, the shell of the ‘proto-something’ was disrupted – the part in contact with the earth being vaporized, the part the other side shearing off, while the nucleus melted – not quite vaporized – and eventually sank to the centre of the earth, coalescing with the original nucleus. Thus we had a ‘new earth’ with a large and heavy core, being the original cores of two planets, a rather extended shell, from 1.5 planets, and a large chunk of shell which, due to the original closeness, and being slowed substantially by its separation from the rest, remained in ‘low earth orbit’, near, but not quite grazing the new exceedingly hot ‘atmosphere’. Add the original speed of rotation of ‘proto-earth’ and the added impulse from the other body, ‘new earth’ could have rotated very fast. At very high temperatures, the remnant atmosphere of the other body would likely leak out into space (cp. the suggestion that the water in Venus’s atmosphere disassociated at high level and the heat of the sun was sufficient to let it all escape) and much, if not all, would have found its way to earth. Over time, tidal friction slowed the earth, and moved the moon away, to what their positions are now. With Venus, assuming that Venus was an original planet, it is plausible that Venus was hit by a large chunk of something, sufficient to bring Venus’s rotation to a small negative number. Just that Venus was hit on ‘the other side’ so to speak. In the case of earth plus moon, the two angular momenta of the parent bodies were additive. In the case of Venus, the two angular momenta were subtractive. In both cases, angular momentum of the system was conserved. As to the quantitative details of mass, velocity at impact and angle of impact which would provide a reasonable answer, I leave it to the astronomers to calculate. Hi Dudley. If Earth was hit almost dead centre as you say, I doubt that would make it spin a lot faster. The whole Moons caused by collision theory is very unsatisfactory in my opinion. Especially considering Earth and Moon chemical composition is pretty much identical.